ST. JOSEPH, MO. -- ​The​ ​St.​ ​Joseph​ ​Mustangs​ ​Front Office spent this past weekend in Kansas City, Missouri with General Managers from around the league at the MINK League Winter Meetings. The meetings came to a conclusion on Sunday with a few new changes planned for the 2019 season. The biggest takeaways from this past weekend include the Mustangs plan to play their first Sunday evening home game since 2012 on June 23rd. Phil Welch will also be the site of the 2019 MINK League All-Star Game, the third All-Star game to take place in St. Joseph. 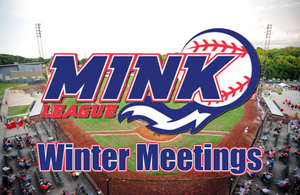 At the meetings, Mustangs General Manager Ky Turner was named to the MINK League Board as Vice President. The full 2019 schedule will be released in the coming months.